You must have a form of valid recipient consent. You must provide a valid, easy-to-use unsubscribe mechanism. You must clearly identify yourself and your business. Your messages must not be false or misleading. Let's use the familiar name John Doe to refer to any given message recipient. Implied consent happens spontaneously when you and John Doe have an existing business relationship (EBR). The existing business relationship only occurs if John Doe has purchased a product, a service, or made a formal agreement with your business within the last 2 years. Simply put, John Doe is a customer of yours. Implied consent is considered a bare minimum CASL requirement. However, that doesn't make it a less manageable, less traceable or less reliable path to achieving respectful customer communications and flawless legal compliance. WHEN WAS THE LAST TRANSACTION BETWEEN JOHN DOE AND MY BUSINESS? When was the last time John Doe purchased a vehicle from my dealership? When was the last time John Doe came for a service appointment? When was the last time John Doe bought anything from us? Regardless of which of the above questions fits your context, if that last transaction was more than 24 months ago, you should not text John Doe because his implied consent is no longer valid. The existing business relationship you had with this customer happened too long ago. Messages sent in the context of full on, two-way conversations with customers. Messages sent as direct response to customer questions, requests or inquiries. Messages that provide customers with warranty, safety recall or legal information about products or services they purchased from your business. Messages that facilitate, complete or confirm transactions with your business. For all text messages falling under the jurisdiction of Canada's Anti-Spam Legislation, Kimoby systematically appends the proper unsubscribe mechanism mandated by CASL, and the sender information link required by CRTC regulations. 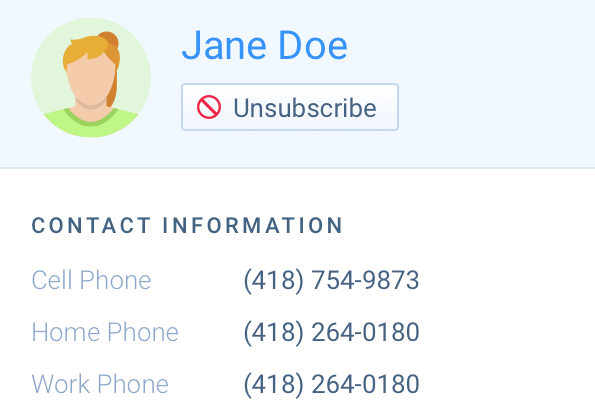 Recipients can easily opt out of receiving your text messages by texting any of the following unsubscribe keywords: STOP, END, QUIT, CANCEL or UNSUBSCRIBE. Kimoby automatically handles unsubscribe requests and unsubscribe list management for you, behind the scenes. Not everyone is comfortable with text messaging and opt out keyword commands. Recipients can easily request to unsubscribe in their own words by replying naturally to any of your text messages.